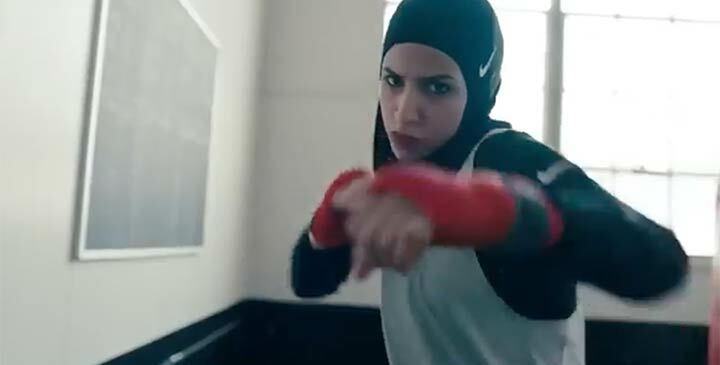 Think you’ve heard everything you need to know about the new Nike ad? Well, guess again. 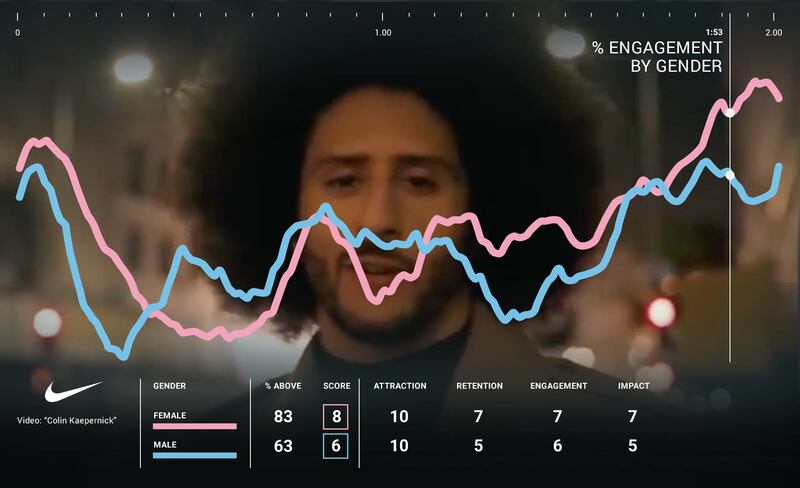 Using our AI-powered emotion tech and new dashboard feature, Verbal Diagnostics, which analyses the overall sentiment towards the brand by looking at viewers' comments, we looked at the sportswear giant’s controversial campaign in more detail to uncover what consumers really thought. 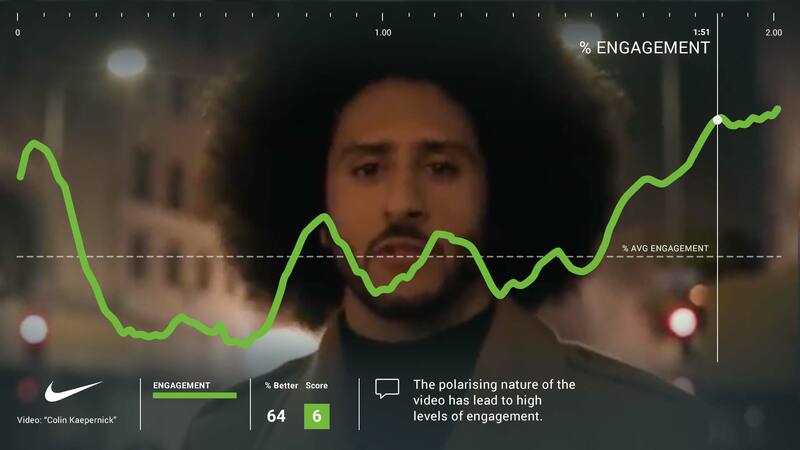 Given the tumult of press and comment across the media, some of the results were pretty surprising, as our tech highlights the differences in people’s perceptions around Nike's campaign. Middle-aged demographic the least positive. 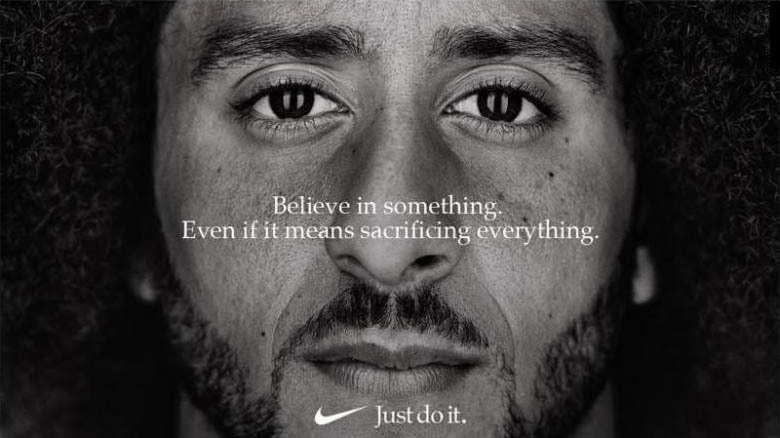 Nike’s decision to make American footballer Colin Kaepernick the face of its new ad campaign has earned the sportswear brand its fair share of headlines over the last past week – some positive, some not so positive. Kaepernick is a polarizing figure in the States. He hasn't played in the NFL since 2016, when he attracted criticism for kneeling during the American national anthem to raise awareness of police brutality against the black community. Other players have since joined the protest – despite outrage from a number of Americans, including US President Donald Trump, who have accused them of being unpatriotic and "disrespecting the flag". But that did not stop Nike. The response to the ad so far has certainly been mixed. When the news first filtered out, the sports brand’s stock price took an initial hit, no doubt sparked by images of people destroying their Nike clothing in protest across social media. Burning socks aside, showing that Nike stands for a lot more than just selling trainers has resulted in a 31% increase in sales since the ad campaign was first reported. But how is the ad going down with ordinary, less vocal Americans? And are there any trends? 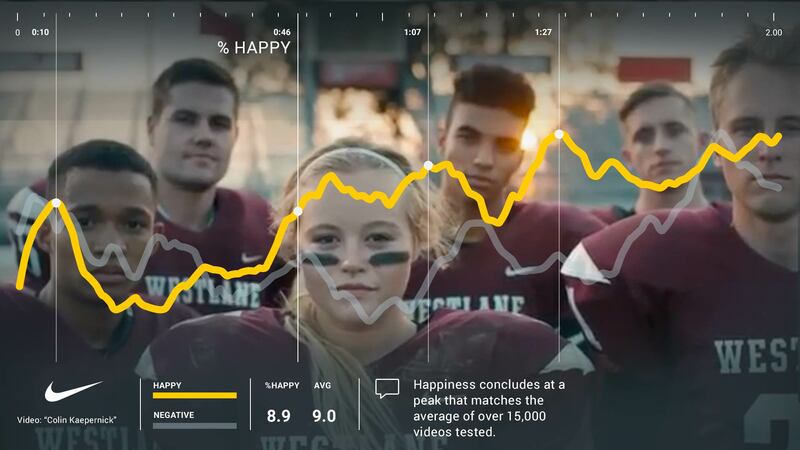 Using our ground-breaking AI platform, we measured the emotional responses of 300 Americans (young and old) to find out what they really think about the ad. 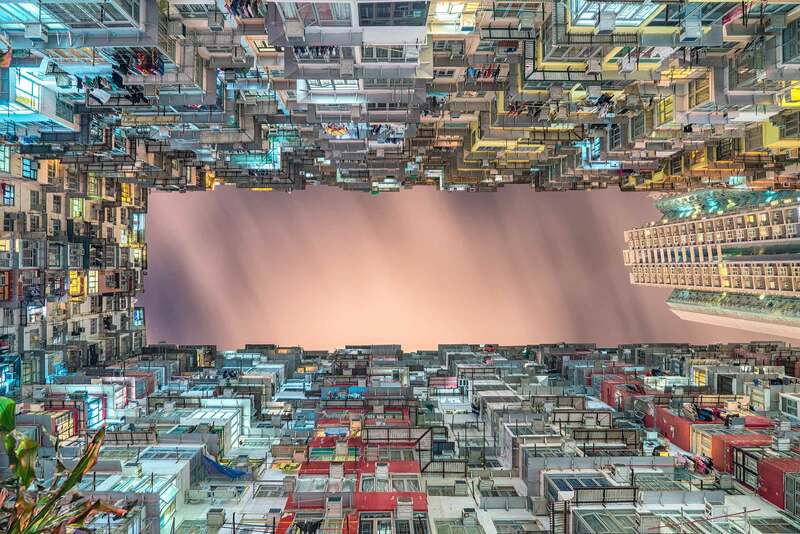 We also asked for their comments after viewing, and used the latest addition to our platform, Verbatim Diagnostics – which uses AI to partition and report verbatim comments into themes – to provide an additional layer of insight into how customers feel about the brand. No one was on the fence with this ad. Unusually, both positive and negative emotions peak at the end and at similar levels, suggesting there was an almost equal divide in sentiment. A very strong start with a significant peak at 10 seconds where the young boy, frame cropped at the waist, poses full of attitude with arms crossed. See how emotion pivots when the next scene, wider frame, shows him wrestling his opponent despite not having any legs. "If you're born a refugee, don't let it stop you playing soccer for the national team at age sixteen." After scoring a goal Davies runs to the crowd with his arms out stretched. He takes a look back at his team mates with a cheeky grin that teases a smile from our audience. Similarly, we see 'emotion mirroring' here as Kaepernick narrates, "When they talk about the greatest team in the history of the sport, make sure it's your team." The female striker scores with a celebratory dance with a beaming smile, we see that the audience responds too. I was neutral at best before the Kaepernick decision. Now, I am completely on board! I just hope there is some financial benefit derived from all this to education, expanding opportunities to less well off communities, and more. I think that it was magnificent. Nike stood behind something and it makes me want to support them more. I am glad to see a company taking a stand. I believe that the ad is powerful and makes a bold statement. I wholeheartedly love that this ad exists. I hope that Nike starts a trend. I think that companies should be socially responsible and stand behind the very people who interact with the brand. 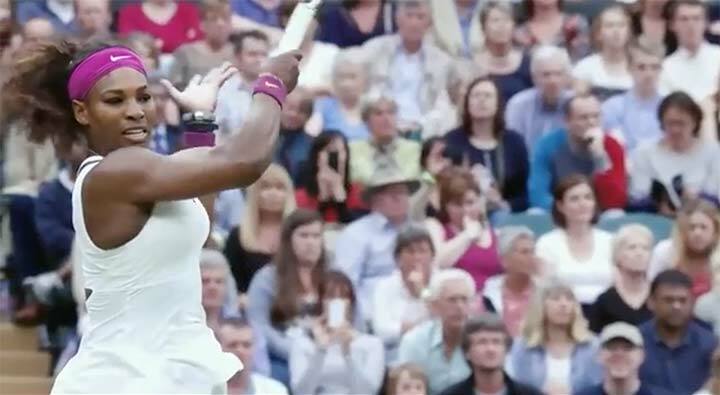 Nike’s ad features other sports stars such as Odell Beckham Jr., LeBron James and Serena Williams - herself caught up in a controversy right now after her US Open Final histrionics. But when analysing the comments among people who disliked the ad, one name really stands out – Kaepernick. In fact, half of the people who said they hated the ad directly reference Kaepernick as the main reason. I hate what Nike has done. Making Kapernick a vision for their brand has ruined their reputation and I no longer can stand with them. What is wrong with America today when all that is being done to divide this country. Leave if you do not like it. AMEN. Their nonsense commercial about Colin Kapernick is total B.S. He sacrificed NOTHING! This is purely a political B.S. ad, which now has me stopping buying Nike in the future! They are sucking up to a person who is trying to use Race as an excuse! This is total B.S. and a slap in the face to our military and police who HAVE sacrificed, including their lives. Colin Kapernick is a victim of himself and NOT anything else. The ad is certainly full of contrasts, both in terms of audience response and the creative itself. By juxtaposing images - such as obesity to iron man, or ‘refugee’ to goalscorer - the ad plays with audiences' emotions, creating tension - particularly among men. This interplay asks the audience to be more contemplative than entertained. The continuous edits between ordinary people and sports stars is a similar technique used in Nike’s ‘Londoner’ campaign earlier in the year. Montages or fast edits are typically taxing on an audience, whereas these edits are held together with Kaepernick’s narration, reminiscent of 'Wear sunscreen' (“Advice, like youth, probably just wasted on the young”). When Kaepernick says something that sounds negative such as, "don't become the best" – negative peaks occur but they soon become positive when his narration resolves. This negative peak is a cluster of edits. "...crazy is not an insult." 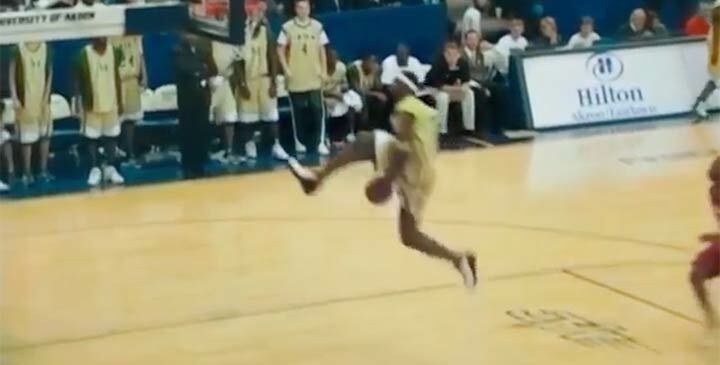 "Don't become the best basketball player on the planet." "If you're a girl from Compton, don't just become a tennis player." With so much controversy surrounding Kaepernick, you'd think that the scenes showing the quarterback would generate the most negative emotions from viewers. 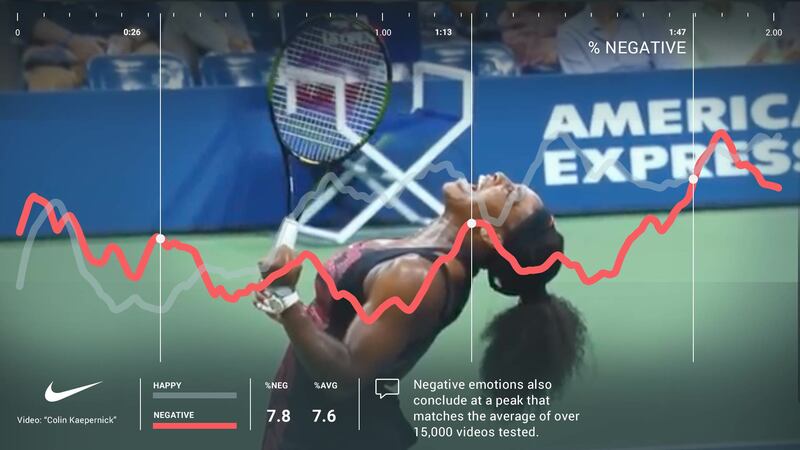 However, negative emotions among people who disliked the ad actually peak during the scenes showing tennis star Serena Williams. This could be because the ad was tested in the aftermath of her controversial appearance at the US Open final. The polarizing nature of the video creates an interplay between positive and negative emotions, resulting in a good overall engagement, especially towards the end. Male viewers had more tension between positive and negative emotions, while women largely contribute to the surge in engagement towards the end. There's significantly more tension within the responses from men, whereas the emotions from women show a significant trajectory of positive emotion. Perhaps men were having a harder time processing the topics within the ad? 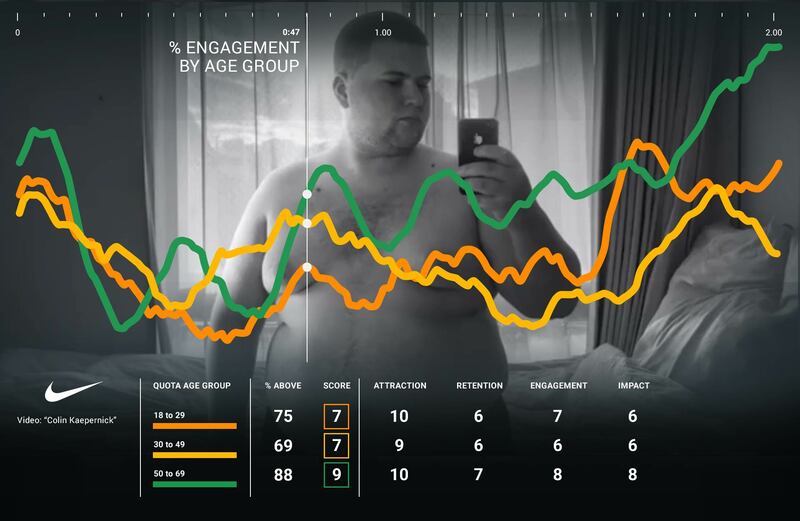 After such a high score of Attraction for both men and women, Men score lower across Retention, Engagement and Impact. The trajectory of Engagement for women is far less bumpy by comparison. 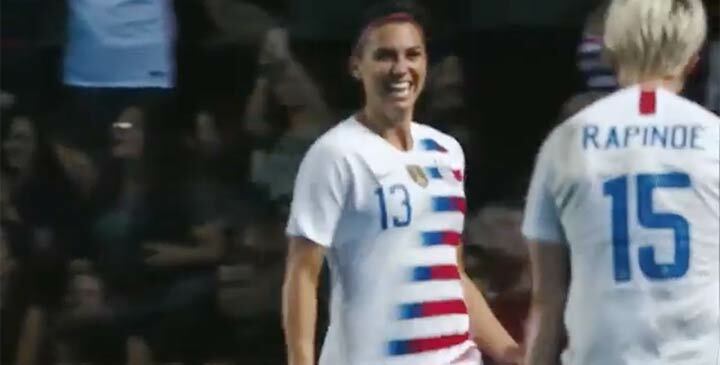 There have been some reports in the press suggesting that the Nike ad has exposed a generational divide among viewers, with older audiences more likely to react badly to Kaepernick’s role in the ad campaign. Our data shows viewers aged between 50–69 were a lot more emotionally engaged with the content, particularly near the end (during the scenes showing the former NFL player). Negative reactions among 50 to 69-year-olds do spike during the final scenes showing Kaepernick. Feelings of happiness also spike among both older and younger audiences at the final scenes of the ad. Nike's share price may have dropped 3% after the ad was released, but this was always a long play from the sportswear giant. If you look specifically at investment from younger audiences, you see a much different picture. For example, investments from under-35s alone have reportedly grown 45%, making Nike the 37th most popular stock on Robin Hood, a digital investment service aimed at millennials. Why? Because millennials like brands who stand up for what they believe in. They like companies who show they are more than just a product line. Get our white paper - see the science behind the accuracy of our emotion measurement technology that gives you an immediate and authentic layer of insight of how people really feel.